AAAIIIIEEEEEEEEE !!!!!! You guys and your software solutions for everything !!!! you could hand draw a simple caustics pattern that you can use as a Gel for a light. And it will give you some wonderful results. 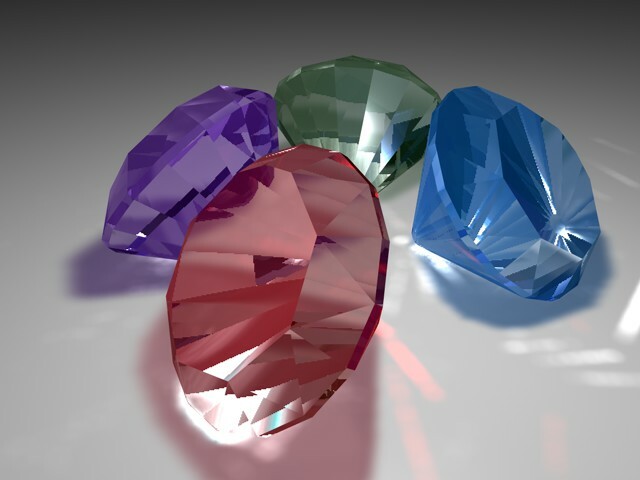 Or just search the internet for “caustics” and you can find all kinds of images that you can borrow from to make a really nice light Gel. Oh, I know it doesn't look anything like ice. Especially after the renders that bombed because I got nil pointer and memory allocation errors. I put a bug report in, but, man, after seeing what could have been... After all the hassles I had, I was glad to just be able to get this render out. I had Sky Light enabled, Indirect Light enabled and set up for Ambient Occlusion only, a couple of Anything Glows lights, and Caustics. All this on a WinXP PC that’s about 5 years old. It’s a scene filled with ice slides, a Stonemason building set, about 6 LoRez figures, 2 Mike3 figures with clothing, and a partridge in a pear tree. get the cheapest computer if necessary to be your render box.....it will no doubt be way better than any 5yr old. that was being worked on in the shop. I'm amazed at how much computer you can buy today for $350! ......they're almost disposable....people pay more for smart phones! 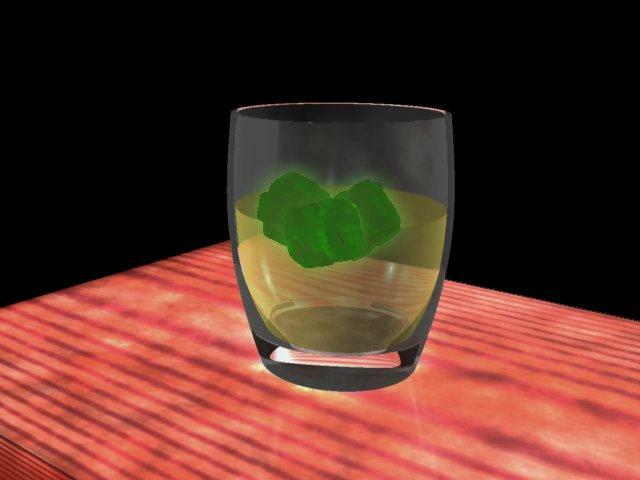 All this talk about caustics made me thirsty - so did a Joe Mamma-inspired practical test an poured a rather large whiskey on the rocks to check for caustics - nope, nothing. From the glass, yes, from the ice, no. Lots of reflection and refraction, but no caustics. Had a couple more to be sure - my wife says it was six, but who's counting. Have a drink, Superman, it'll do you good! What about the plugins for carrara how hard will they be to transfer over? Do I have to track down my codes again to transfer them to the new version? I'm not talking about this version I'm talking about a version that isn't beta, the complete version if you will. Norton said carrara 8.5 exe isn't safe and it removed it (WTF). Well I can't install the new version my antivirus wont allow it. What are you trying to pull here. It's never done it before. I'm giving it another shot. I have notice that it doesn't show the file size that may be the cause of it or not. It just shows how much I have downloaded. It doesn't show how much out of a certain amount. This is what it says. What the heck am I supposed to do I can't get it to stop is there anyway for the programmers to make it trust worthy. 64 bit nor 32 bit is any good the anti virus kicks it out and utterly destroys it completely with no way to recover it. You will find it in your quarantined files. This is an annoying Norton characteristic, it quarantimes any file that it doesn't recognise. You simply need to restore it from out of your quarantine folder. Cant figure it out. I went and found the quarantine folder but no matter what I do I can't get in. I try to figure out how do it from norton, but that doesn't work either. Maybe time to switch to another anti-virus? Never had any problems with AVG, or NOD32 with downloads/installs, slow downs, or other annoyances......no viruses as far as I know. Had to have a go at caustics and did this Dark Crystal. I had to bump the intensity to 500, and photons to 70k to get enough caustics. Just an experiment. Mcafee was worst, but norton hasn't ever done this before. I'm not changing anytime soon I guess I wait norton out then try a different one. Besides there isn't much of a difference between 8 and 8.5 for now. I changed to Avast, after being reccomended to it by several people. It has the advantage that you can download the free version and use that, if you like it then you will get an option to upgrade to the paid for version. I loaded everything from "Sacrament" (http://www.daz3d.com/shop/sacrament) into DAZ Studio 4.5, saved the scene as a .duf, then tried to open it in the current C8.5 beta. I just get the dreaded "An error occurred while executing Open." Any ideas? Also tried creating a new Scene and using Import. I still get the same error, but all the items show up in the scene list but they aren't really there (invisible). yeah, I preloaded sacrament in Poser and opened the pz3 in Carrara for that reason. Jack does not use Carrara. I did at the time of it's release when I bought it suggest an optional full scene for that reason but he was uninterested. oddly the Dream house loads correctly. importing it as an obj might be the only other way. So, if I remember correctly, if I'm getting "Error: File Cannot be Found" errors, I need to refresh and re download for Genesis items? Is there a list anywhere for this or is it all "hit and miss"? If it's not, am I to reset/redownload everything? Do I need the latest DS if I'm NOT using Smart Content? Avast very hard to uninstall and they keep sending emails despite my unsubscribing 3 times. Now switched to Commodo ( again ) as I had used it a long time ago - free and very happy with it. Here is a silly question. How do I get a basic Genesis figure in the Beta? I can't seem to find where to create one. you need to have Daz studio 4 installed and it in your smart content first. Then it will be in your Carrara smart content too. Is there going to be a new serial or perhaps another build ? so has mine.. it was supposed to last till the 15th September according to first post! The previous serial number (CDZCPRO-085-0000026-BLW-001-EBTOLPQ ) was set to expire August 31st. Since it is still August 31st here, my Carrara 8.5 is still working. But I suppose tomorrow when I plug in the newer serial number (CDZCPRO-085-0031100-RLS-001-EBTQFSA ) it will fail too. And since DAZ always arranges for serial numbers to expire just before the weekends, I suppose we'll all have to wait until Monday before the issue is fixed. Edit: Oops, I forgot, Monday is Labor Day, so we wait until Tuesday. Sorry Folks - False Alarm. Using 5.5 build 149 because latest has serios flaws. funny, I had to put in the latest serial yesterday too! I had already on the latest build which I replaced with the previous one, just thought it must have used the serial previously associated with it so re-entered it without much thought on the matter!